Shane Snow and his Contently Co-Founders had a booming business- that almost completely crashed after they found themselves strapped for cash and struggling to meet payroll. Plus the nutritional bang-for-the buck of popular diets, including the Keto diet and ramen noodles. We made this enormous mistake that almost killed the company a year or so into the business. We looked at our bank account and realized that we had two weeks of cash left. 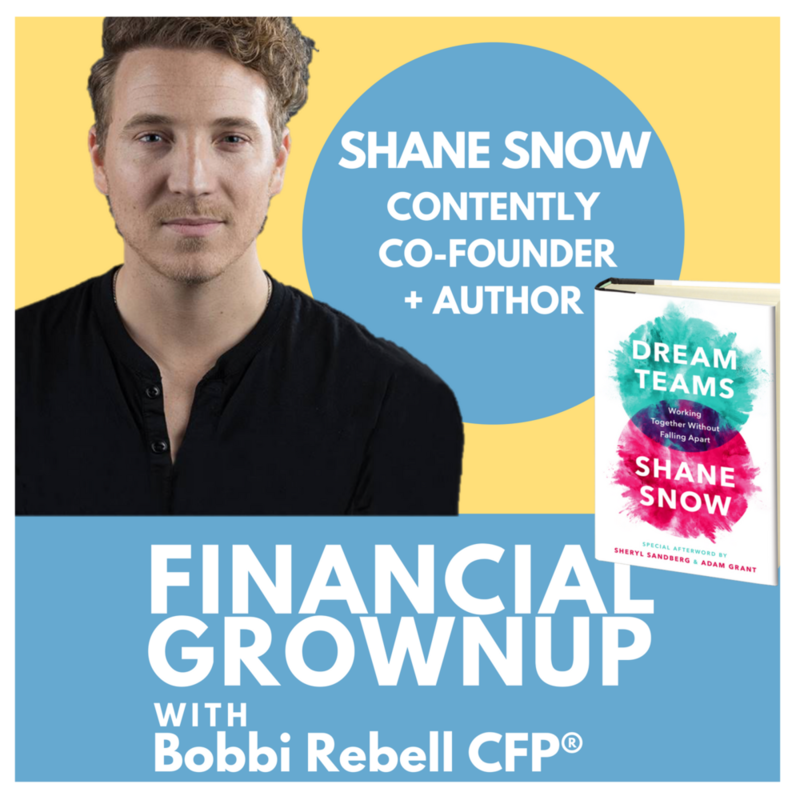 You're listening to Financial Grown Up, with me, Certified Financial Planner, Bobbi Rebell, author of How To Be a Financial Grownup. And you know what? Being a grown up is really hard, especially when it comes to money. But it's okay, we're going to get there together. I'm going to bring you one money story from a financial grownup, one lesson, and then my take on how you can make it your own. We got this. Close call for our guest but, spoiler alert, they did escape that near-death experience. The company, Contently. The voice you were hearing was co-founder, Shane Snow, who just released his latest book, Dream Teams. Before we get to more about Shane and the book, a quick welcome to our new listeners and welcome back to those who are returning. We try to keep our episodes to just around 15 minutes because we know you guys are so busy, but you can also, of course, binge if you're a commuter or you just have a little bit more time some days. The idea is that you invest the time and get an inspiring money story from a high achiever that gives you value and you also get an everyday money tip that you can put to work in your life or your work, right away. All right, you're going to get that here. Shane Snow is an entrepreneur, a journalist, an author, so much more. I wanted to have him on to talk about his most recent bestseller and that is, Dream Teams: Working Together Without Falling Apart. It's tough to get along, teams are hard. It's sometimes just easier to work alone and he talks a lot about that. Shane jokes that he hates business books, but this book is really more about people and stories and things that we can really integrate into our own lives. I learned a lot of things about history and the world that I thought I knew about, but there were nuances that people have never really shared publicly. And Shane is a master at research and revealing the full story when we didn't even know that we had part of the story. Here is Shane Snow. Hey, Shane Snow. You're a financial grownup, welcome to the podcast. Thank you, I feel like a grownup. You're definitely a grownup, you have so many accomplishments. The latest one, and we're going to get to all of them later but the latest one is your new book, Dream Teams: Working Together Without Falling Apart. And you've had quite a week promoting it, lots of accolades. Congrats. Thank you. Yeah, it's been a lot, a long journey. And it's basically of stories about how different teams work together, and often don't work together. Yes, it's about that paradox. That normally group work is much, much harder than we think it's going to be, to the point that actually working by yourself is often more productive than group work. And yet sometimes we change the world when we work together. And one thing that changed the world is your company that you started eight years ago, part of team, you're a co-founder. Tell us about the company. And your money story has to do with what happened when you weren't really watching all the numbers, just some of the numbers. And the name of the company is? And it grew into a much bigger business than we thought it would, which is great. And initially the first piece of the business that we build was this marketplace for getting freelance journalists and photographers work and getting them paid. And a lot of the clients were brands, so it was this new branded content marketing thing. So Pepsi wants to hire some reporters to go cover a conference and write about it for their blog, that sort of thing. So what happened, we started getting excited because the business was working. We're getting lots of work for these journalists and lots of clients, and we made this enormous mistake that almost killed the company a year or so into the business. We were looking at all the money that our clients were on the hook for paying us and realized that we had this runway for six months before we would need to raise money from investors again, or maybe figure out how to get profitable by then. So things were going great, but we then looked at our bank account and realized that we had two weeks of cash left. Nobody had been paying attention to cash flow. The fact that we actually pay these creative people who do the work for the clients and the clients take a long time to pay us, basically we were floating all of this money. And nobody had bothered to ... We didn't have a finance person, we were a start up. So basically there was a lag between the receivables and the cash that you were actually paying out. You were basically acting like a bank. Yeah. And the more successful we were, the worse it got. And so thank god someone checked and we were like, "Oh, no. We have two weeks left before we literally got out of business because of this problem." And so we founders cut our salaries so that we could put that toward payroll for our employees and we just sort of prayed for a miracle. And the miracle did come, but basically we asked our customers if they'd be willing to pay us upfront for what they excepted to be paying these freelancers. And basically everyone said yes and then we actually got a positive cash float, like a cash carry I guess? Well, you worked together as a team. You worked together as a team and figured it out, right? Yes, yeah. We asked the clients if they would do that and they all said yes and we got our investors to sort of float us for a few more weeks. But I learned this as sort of a personal lesson, that even through it's sort of obvious, that cash flow can kill you basically. And so I've started paying a lot more attention to my cash flow and my personal finances, as a result of this. So what is the lesson for our listeners, regarding your money story? Well, it's really not profit, it was revenue was coming. Right. The revenue number, exactly. But even in your personal finances I think, paying attention to just the salary number is not actually the one to pay attention to. And when you're getting money in and when you're paying money out is sometimes more important. I want to get to your everyday money tip because this is a really good one. I am personally very curious about this because I keep hearing about this and it's a little bit experimental. But let me let you tell it, go ahead. Okay. So I really like doing personal experiments and gonzo journalism, so one time for GQ I ate only this "healthy", in quotes, ice cream for ten days and lost a bunch of weight. And anyways, so I like doing stuff like that. And there's this stuff called Soylent that came out maybe five, six years ago, that's basically like a meal replacement drink, kind of like the goop on the Matrix. It's not supposed to taste like really anything and it's supposed to have everything your body needs. Do you eat it for every meal? Is it like a full on thing? It ends up being something like eight buck a day. If you want to do the pre-mixed ones, which is even more convenient, then it's a little bit more but it's still ... It actually reminds me, I had this friend, one of my best friends in the world, in college he was trying to micro-optimize calories for percent, or whatever, in his diet. And he figured out this optimum combination of oatmeal and rice and he was miserable but he saved so much money. People stereotype that people that want to save money, they eat only ramen noodles while they're paying down their debt. I wonder what the nutritional value per serving, per cost, is for ramen noodles versus this keto diet and all the other diets. That's just, I don't know, interesnting. Yeah. Well, getting it right, because you don't want your brain to not function. I imagine that eating only ramen noodles is very bad also for your digestion I bet. All right, wait. Let's talk about your book. Because I'm obsessed, I literally meant to just read enough to kind of get through the interview but I read the whole thing. I spent a little over four hours, you spent four years writing Dream Teams. One of my many favorite things about this is that it's almost like a suspense thriller because it told these stories where there's always these zingers at the end of each story. Yeah. So I wanted to explore that paradox, that we say that two heads are better than one and, yeah, all of these things that you just said. And it turns out that research shows that's usually not true, and anyone that has worked in a group project at school knows that sometimes it's much easier to just do it on your own rather than in the group. And the bigger a team gets in business, the slower things get, the more communication is a pain, but there's all sorts of other psychology that basically says that group dynamics get in the way of productivity and progress. And so I wanted to explore that and kind of what does science and research tell us about our common conceptions about working together, so that we can actually fulfill that promise of becoming better than the sum of our parts. Well, I don't feel like this seems like a business book because you have everywhere from Wu-tang Clan ... Did I say that right? The Russian hockey team, which, by the way, there's a zinger in there that I did not know. This whole miracle on ice with the US team. I don't know if people knew what really happened on the Russian side but let's not spoil it for them, but you gotta read that one. The Wright Brothers, the importance of play in being successful, and why a lot of mergers fail. And even you've got George Takei in there and how pop culture and people seeing things be normal changed our cultural expectations. Well, thank you. What I wanted to do is talk about these things and the real research and the real science that can change our minds and, in some cases, blow our minds, about this. But I wanted to do it through stories that are fun, even if you don't care about the lessons. That for me, I wanted to write the kind of book that I would like to read, which would be more cinematic with surprises and twists and stories that I was excited enough to learn about that I would actually want to write about them too. So I'm glad that ... It is a nice compliment that you got through it so fast and enjoyed the stories. I think everyone will get through it so fast and then they can read your previous book, Smartcuts, so it's all good. So Shane, tell us where people can find out more about you and where they can follow you on social media, because I know your selective in your social media. I'm pretty selective in my social media. So shanesnow.com has links to everything. And well, anyone that's listening to your podcast, I can give them my Instagram. It's not Shane Snow, it's maneatingrobot. Yeah, of course. It's self-explanatory, I think. I actually really like maneatingrobot because depending on the punctuation it's either a man eating a robot or it's a robot eating a man. Okay. I have to about about that. Ah, ah. I'm a little slow on the uptake. All right, Shane. Thank you so much, this has been great. And congratulations on the book and all your success. Wow, pretty rare to go from bad cash flow management at start ups to the financial versus nutritional value of keto diets and ramen noodles. Bu there you have it, the wonderful Shane Snow, so much fun. Financial Grownup tip number one. In Shane's book, Dream Teams, Shane has a lot of data. One of the data points that he talks about is statistics linking the fact that the most successful people in the world are also what I would call intentional readers, meaning they read at least a book a week and make a point of it. They really carve that time out of their day to make sure that they read because that's where they feel that they learn about the world and become interesting people. You're busy, I'm busy, we're all busy, but they're busy and they find time. I'm right there with you, I know it's hard, but try an experiment, maybe with Shane's book. I read it on my Kindle and it said, for example, that it would be over five hours, but because there were so many notes from Shane's research at the end it was really maybe four and a half, let's say. So this week, this is my challenge to you guys, pick up Dream Teams, you can do it with another book but Dream Teams was good. On your calendar, block 45 minutes either early morning or before bedtime, do it before you turn on the TV, before you reach for the phone and start going through social media, set it an alarm, book it as an appointment in whatever you use to book your appointments. By dedicating 45 minutes-ish, a night, for the week, you'll be done by the end of the week and you'll probably have some interesting takeaways from the book as well and feel like you really got value from that time, versus just mindlessly scrolling through your feeds on your social media. Maybe then go write a nice review for Shane, authors love reviews. I love reviews, you could write a review for the podcast too. But consider making it a habit to go through and read a book a week, once you do it, you might really enjoy it and it'll stick and it'll be a great thing adding to your life. Financial Grownup tip number two. Shane talked about how his keto-loving friend liked the idea of not having to think about what to eat, it just removed a decision. So removing decisions that are discretionary is something that a lot of leaders do. Consider that, maybe have the same breakfast every day, or buy all the same socks. Whatever it is that removes a decision, that removes having to do that one more thing each day. My son's school, for example, next year has uniforms, so that's going to be a new thing for us. He's pretty good in the mornings anyway, but it's going to be interesting to see how removing the decision of what to wear in the morning impacts his morning routine and, in turn, impacts my morning routine. On that note, we hope that you are making Financial Grownup part of your routine. If you like the promo videos that you see on social media, share them, you may even win one for your company or yourself. And just tell a friend if you like the show, and let them know so we can grow our community. If you want to be a guest, you have a great money story or money tip you want to share, tell us by emailing at info@gfinancialgrownup.com, that's info@financialgrownup.com, and you may be a guest on the show. Follow us on Twitter @bobbirebell, on Instagram @bobbirebell1, and on Facebook I am @bobbirebell. Shane Snow has come a long way from his cash flow crunch, so thank you Shane for helping us all get one step closer to being financial grownups. Financial Grownup, with Bobbi Rebell, is edited and produced by Steve Stewart and is a BRK Media Production.